A. We accept Visa, Mastercard and Discover. We do not currently accept American Express. Q. How soon will my wagon ship out? A. Most wagons leave the shop 2-4 business days after your order is received. Shipping from the shop to your location will vary based on UPS transport times. California orders may take up to a week to deliver once given to UPS. We do not guarantee the ship-out time, though we offer estimates, because the shop will occasionally be out of a particular wagon or color, which may add processing time. Q. Which Amish wagon should I get? There are so many! A. This depends on several questions. Where are you going to use the wagon? Depending on the terrain, you may need to narrow your choice based on tire type. See our Tires and Load Capacity page for more about the best tires for your terrain. Once you know what kind of tires you need, you may want to consider if you want the classic wood bed, or if you need a poly plastic wagon model. Then, consider what the most significant use will be for your wagon: Carrying beach suppies? Pulling children? Hauling pumpkins? Depending on your usage of the wagon, you may want various options, such as a wagon canopy, wagon cooler carrier, seating or cushions, or a trailer. See the Amish Wagon Accessories page and work back from there if there is an accessory you definitely must have. Q. I can't decide between Speedway Express Wagons and Valley Road Wagons. Which one is better? A. This is one of our most common questions. The wagon brands are both excellently constructed. They are both enduring favorites over the 15+ years that this business has been in the family. We highly recommend every single one of our brands, or we would not carry them. Often, we find that people make their choice finally based on an accessory they particularly like, or want to purchase later. Perhaps start with the Amish Wagon Accessories page and work from there to make a decision. Q. Should I get a wooden Amish wagon or a Poly Plastic Amish wagon as a beach wagon? How should I care for a wooden beach wagon? A. If the wagon will be getting quite wet for long periods of time, it might be better to go with a poly bed. That said, the plastic option is fairly new; people have been buying the wood wagons for the beach for years and love them. With basic care, such as drying the wagon if it is wet, throwing a towel in the bottom to catch most of the dripping from beach items, and maintaining the bed with a coat of varnish as needed, the wood will hold up well. One our our family's Amish wagons with a wood bed is going on 20 years of regular service on a homestead and as a pull cart for cart goats, and another wood wagon is pushing 15 years of similar use. (One is pictured on the About Us page.) We would hose the wagons out occasionally to clean them, and make sure to tip them up to drain and dry, and we never just left them to sit out in the rain. They have a bit of wear and tear after so many years, and perhaps a few goat chew marks, but are perfectly functional and useful. That said, if you know your wagon will experience more than the usual moisture and dirt, we do recommend the poly wagon bed. The poly wagons have the added benefit of still maintaining the Amish classic look while providing greater water resistance. Q. I got my Amish wagon, and there are no instructions. Did the shop forget to include them? A. The Speedway Express welding shop does not generally include instructions with their wagons, even though it is now in the second generation of business, because, in the words of manufacturer Mr. Lapp: "There is no way to put the wagon together wrong." We appreciate his confidence in the straightforward make of his wagons and the mechanical skills of our mutual customers, but if you do have questions, e-mail or give us a call. We average only one-two customers a year who actually do call with an assembly problem, so the simplicity of the design speaks for itself. Q. How much can my wagon carry? The Maximum Safe Load Depends on Wagon, Terrain and Person. -The weight times the number of tires is not necessarily the total safe maximum weight for the combination of wagon, load, terrain and person pulling; the most comfortable, safe top weight will vary by the person pulling and variations in the terrain. -Pulling up a slope of even 15 degrees will add more than 25% of the rolling weight to the drawbar force. Keep this in mind if your terrain is hilly. -A tire pressure of less than half the rated maximum is not recommended especially for tubeless tires. Remember to keep your tires properly inflated! -On this site, a wagon is only called a "beach wagon" if it has the largest tire size of 13" x 6.5". Q. Which wooden wagon do you recommend for families with kids? A. Many people buying a classic wood wagon for families with 1-4 children seem to prefer the Valley Road models 310 and 350; the Speedway Express models 330 or 500; or the Berlin Flyer models F310, F400/401, or F410. Q. Should I get a wagon Sun Top or a Conestoga Cover for my Amish Wagon? The Conestoga Cover for your wagon is very cute, and is a must have for Fall festivals, country parades, and just walks around the block. It is somewhat more confining and warm in the summer, though the ends open, of course, so that is why the wagon Sun Top is an option if that might be a concern. It keeps the same feel as the Conestoga Cover, but allows more air flow during hot summer months, and easier side access to the wagon. They are both popular products; it depends when and where you plan to use it. Q. How do I transport my wagon? A. Well-made wood over welded steel frame wagons from Speedway, Valley Road, Berlin Loadmaster and Hochstetler can be heavy, around 50-58 lb. for the 40 inch class. Smaller Berlin wagons, EZ fiberglass, and Radio Flyer hollow plastic wagons are lighter at 25 to 45 lb. But the Hochstetler recycled plastic is several pounds heavier than the same design with wood. Woodstake style wagons are most easily loaded when the weight and bulk of the removable racks are off, and the wagon can then be gripped across its girth. Loading one end at a time is also helpful where there is maneuvering room. There are small platforms on the market that can be attached to the back of a vehicle, much like a bicycle rack, and some people use these to transport their wagon. Valley Road, Speedway, and Hochstetler wagons have the nominal size of the bottom plywood (or other) sheet called out once and rounded down to the nearest inch. The rack holders or racks do not extend beyond the bottom sheet. Berlin, Valley Road, Speedway, and Hochstetler wagons all have a tongue that sticks out beyond the wagon's nominal size. The tongue is about 6-7 inches out, and it has parts starting above an inch below the tire diameter. The steering can be turned to a deep angle to shorten it but then the handle and wheels change position. Usually only the biggest tires on the smaller wagons extend out when the position is changed. A track width dimension is measured across the tread centers, not outside edges. As far as height, removable wood racks allow the handle to drop lower, and setting a wagon inverted helps if the handle has someplace to fold or has been removed. Handles are fairly easily removed and can be made easier with "hitch pin" hardware available at mower or industrial supply stores, but wheels are generally not removable. Q. I noticed that all of the tricycles are "powder coated," as are the Hochstetler wagons. What does that mean? A. Powder coating is an advanced method of applying a decorative and protective finish to a wide range of materials and products. Powder coating is a dry finishing process, in which finely ground particles of pigment and resin are electrostatically charged and sprayed onto the products to be coated. The parts to be coated are electrically grounded, so that the charged particles adhere to them until melted and fused into a solid coating in a curing oven. The result is an attractive, durable, high-quality finish. The powder coating process itself offers another advantage -- it is environmentally friendly, and virtually pollution-free. Q. Are there any safety issues that I should be concerned about? A. Non-Amish products listed come with manufacturers warnings as applicable. Further cautions may be found on the complete manufacturers' instructions. Products which are sold unassembled must be assembled by an adult. Small parts must be kept from children. Items which are intended to be used as small parts are not intended for use by children under 3 years of age. We always recommend the direct supervision of an adult and use of seatbelts if children are using wheeled toys. Q. What size of wagon is better for a child to pull versus an adult? What about for my dog to pull, or for me to pull with a tractor? A. Wagons intended for handling by kids have a maximum practical size of 21x42 due to the weight topping 50 lbs. Bigger dogs properly tied into a dog shaft seem to have the energy to pull the largest wagons. Wagons pulled by machine must be full frame wagons like the Berlin 600, Speedway, Valley Road, EZ and Hochstetler brands larger models. Q. Do Kettler tricycles break down for transport? A. Some Kettler wheel toys easily break down for transport or adjustment. The Navigator, Happy, Junior and Oceana, for example, have a two-piece frame joint that may be separable without tools. This is not true for one-piece older or older non-adjustable two-piece Kettrikes. All tricycle pushbar styles and brands are removable without tools. Kettcar models Kabrio has a frame hinge point that will allow the steering column to drop down with the removal of one bolt. Q. How should I maintain my wagons and trikes? A. Kettler recommends a drop of oil periodically on the bearings of its products, and, we add, especially if they are always left outdoors. On wagons with grease fittings, it will take a long time with a lot of use to really need to relube the wheels. On other wagons with ball (or sleeve) bearings infrequent oiling will do. If an item has been left in moist conditions long enough to get rust spots, we recommend products from RustOleum, mar-hyde "One Step", Klean-Strip, Rust Kutter and Dupli-Color directly on rust. For smaller areas of the worst or most critical areas of rust we recommend Klean-Strip brand Rust Converter. Q. I've never heard of a fiberglass wagon. What are the benefits of fiberglass in a wagon bed? A. Fiberglass reinforced plastic is a composite reinforced with very thin strands of glass fibers woven or matted and then saturated with a polymer matrix, typically epoxy resins, which hardens around the fibers. If the process is layered into a mold with an initial thin coating of a pigmented hard epoxy called gel-coat, a beautifully smooth pre-colored surface results, which can also be painted. The end result is a solid material that is strong, attractive and very water resistant. This material is frequently left unfinished to show off the brown/gray weave look in high-tech material. Fiberglass will often be called plastic because of the epoxy resin content that binds the glass fibers. Q. 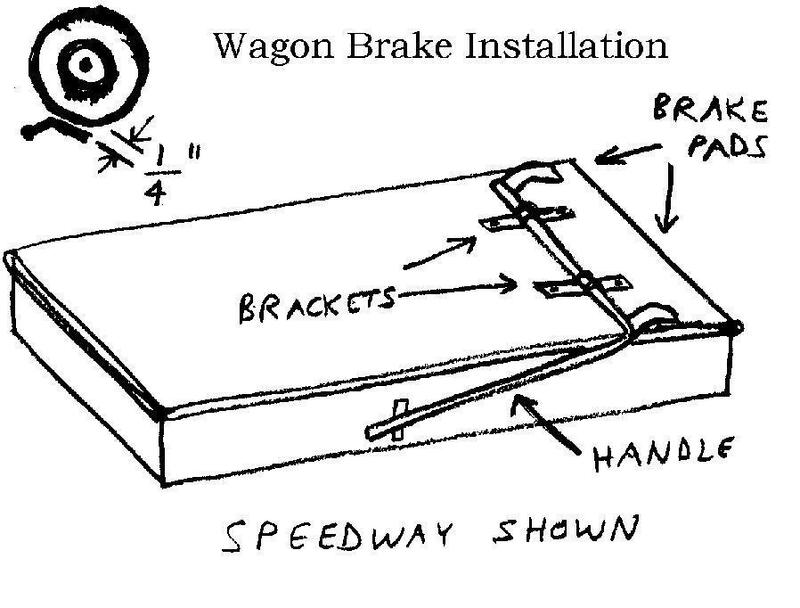 How do I install the brakes on my wagon? 1. Invert the wagon. Push brake between rear axle braces – if wheels are not yet on the wagon it will be easier. Long handle part goes along the side of the wagon and the two pivoting brackets with holes can be placed flat against the plywood wagon bottom. Put the heels on the axle if not already on. 2. Center the brake on the wagon bottom and position the assembly and the handle position so that the ends of the metal brake pads are against the plywood bottom. Slide the brake with pads touching the wood until the other sides of the brake pads are ¼” from each tire tread. The alignment of the side handle should be so that it just clears the plywood wagon bottom by about ¼”. Test fit the side lock as the brake is aligned so that the lock will catch the nub on the end of the handle. Adjust it if needed so that the ¼” clearance at the tires remains. 3. Center the two brackets within their play and mark the holes on the plywood through the mounting brackets. Drill ¼” holes at the four marked positions. Carriage bolt the two brackets with four bolts from the wagon top side. 4. Make sure tires are inflated, and align the side lock to allow enough pressure at the handle to deform the inflated tire. 5. The picture below might be helpful. For any questions, please use our “Contact Us” page to reach us. Q. How do I maintain, replace, or repair my air tires? A. Any air-tire item will need a tire pump every few seasons. Below are useful hints. Check the page titled “Part Sources, Manuals Warranty Information Contacts” for sources of replacement tires and tubes. The air tire valve is difficult to access: If your pump nozzle end is too big or too short to properly fill an air tire, solutions are available. Some toy wheel rims with trim covers may be made more accessible by taking apart enough of the axle to pull away the cover, exposing more stem length. A handy solution is also a valve stem extension which replaces the cap. Look in a hardware or auto parts store for a card with four pencil diameter black cylinders about 1.3" long. The tire is flat: Flat tires from punctures are very rare especially where the tire loading is only a small fraction of its capacity. A common issue for small tubeless tires is a break in the tire to rim bead seal covered below. A new wheel/tire assembly purchase may be simpler especially if the rim is rusted; e-mail manager@durabletoys.com with your item number, brand and shipping address, and we will send out a replacement wheel and new axle retainer. Most flats can be repaired without any disassembly only prying the tire half way (one side) off the rim. Tires may have have an inner tube or have a sealed rim and a tire that is coated to stop leaking--a tubeless tire. It is an option to add an inner tube where it was previously a tubeless tire. Spotter's guide: A tubeless tire will have a valve stem that is much thicker at the base than the diameter of the hole in the rim. It is set tightly as a grommet and won't be easily pushed or pulled. An inner tube's valve stem will be only slightly tapered and you will be able to see the edge of the hole in the rim. I need to sealing a small tubeless tires on a toy: It is often hard to get a tire without an inner tube to seal all the way around both sides of a tire/rim bead. Tire pros have a device at the shop to blast a lot of air in all at once, and it works well. If you wish to try this yourself, you could use this method: Jack up the tire so that it has no flattened side or loading and wet both beads with tire mounting lube, vegetable oil or water and detergent. Take a cargo strap or rope and put it around the circumference of the tire along the center of the tread. Pull it tight and then put the air in, it may also help to thump your fist on the tread to momentarily displace some trapped volume outward at the beads. When the bead seals be careful not to suddenly overinflate (especially a small tire) beyond the maximum pressure on the sidewall. For difficult repairs, you may consider looking up your local lawnmower repair shop or bike shop. Q. Where do I find replacement parts, manuals, and warranty contact information? Some new products have a warranty which the manufacturer honors per the included papers, or you can request information from them at the contact information provided below before purchasing. For new products with missing or damaged parts, contact us at manager@durabletoys.com with your order number. The manufacturer may prefer that you contact them directly, and they will ship parts directly to you, and we will facilitate that as necessary. Older durable items are generally worth fixing when in need of parts. KETTLER Brand Items: For Kettlerrepair parts, add-on accessories and warranty info call direct to the USA toll free phone number: 866-804-0440 or email parts@kettlerusa.com (Kettler only). Kettler Owner's Manuals are available in PDF format at: http://www.kettlerusa.com. Tires for Valley Road Speeder Wagon, Berlin Express Wagon and Speedway Express Wagon: Your local tire store is the best source of these commodity sized tires and inner tubes. For frame repairs, local welding or muffler shops are the best option. For wagons purchased from WagonTrainToys.com, we can source the correct wheel/tire combination (and axle retainer) or new wood or steel parts. Send an email with the model name or number as described on our web page and the color along with the order number or approximate date of purchase (since the design could vary). For damage beyond a single wheel or for new custom construction, we can also ship out just a wagon bed, or just a wagon wagon undercarriage kit. Contact manager@durabletoys.com. Air Tires, Wheels, Inner Tubes: Wheel toys with air tires use commodity sizes of tires although the rim could be more special. See the Frequently Asked Question above for more air tire information. Local farm supply, lawn mower and industrial supply stock commodity sizes of wheel/tire sets that match or are close to the originals on larger wheel toys. Tire stores will have tires and tubes and the equipment to change a tire on the same wheel rim. See above for contact information for tires Kettler brand items. We will source wheels/tires only for wheeled items that we sold. Hard Rubber, Plastic Tire/Wheel Combinations: Many hard tires are specific to the maker's design. A close substitute is possible but may have to be fitted in person; there are too many variable to guess long distance. Wheels/tires from larger companies may vary from popular sizes. We will source wheels/tires only for wheeled items that we sold. Other Amish Wagon Repair Parts: Most complete frames with wheels/tires are available for sale by calling if they are not already on the site as kits. Amish wagons use standard hardware and materials that are available locally from hardware stores. Major repairs to frames can be handled by your local welding shop, and even some customization can be fabricated from stock materials. There is virtually no part on an Amish wagon that is crafted with specialized materials or machines. Aside from accident or abuse, a heavy Amish wagon frame that ever fails can only be defective, and the maker will stand behind his work. We will source component parts only for items that we sold. Some Additional General Help: Every town has welding shops that would be happy to help you. Auto exhaust specialty shops also have the capability to weld thin steel such as tricycle frames. Paint welded areas right away. JB Weld is a really hard epoxy repair material that we know works.